The sprawling mass of Tom a' Choinich takes the form of a triangular pyramid, with three major and one minor ridges converging on the summit. 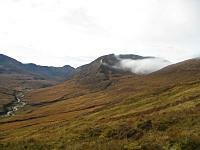 The main ridges run NNE to Creag Dubh, ESE to Gleann nam Fiadh and to the WSW a long winding ridge leads to Carn Eighe. A short narrow E ridge leads down to a Bealach Toll Easa from where paths lead to Glen Cannich and Glen Affric. 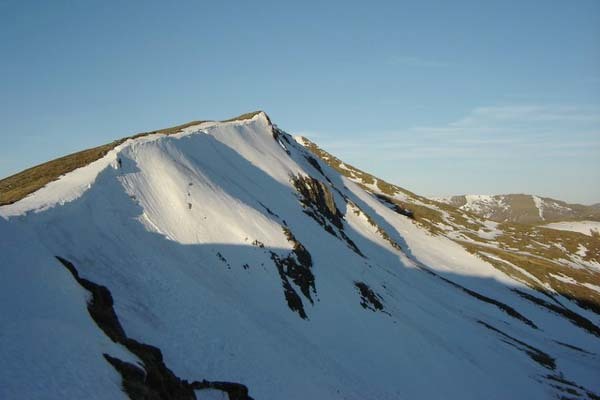 Whilst some of the slopes are very steep, there are good ascent routes via the W and WSW ridges. The summit ridge of Tom a' Choinich from the ESE ridge. Christmas Eve 2006. 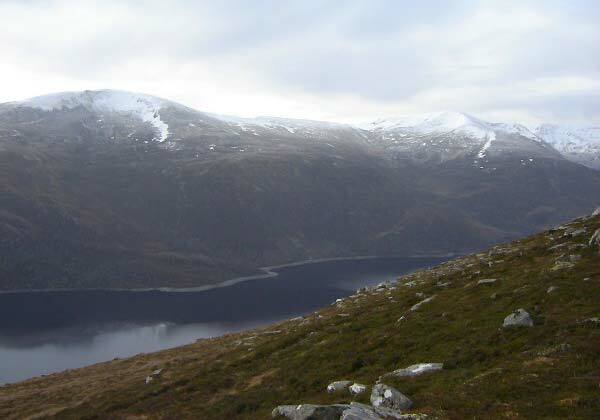 Looking across Loch Mullardoch to Tom a' Choinich(R) and Toll Creagach(L) from the slopes of Mullach na Maoile (Carn nan Gobhar). February 2007. 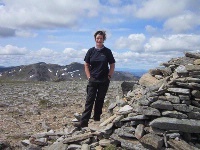 The summary information of one or more ascent routes that include Tom a' Choinich. 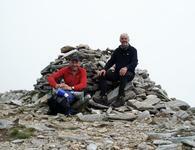 1 1196 m 16.11 km 5.5 hrs Tom a' Choinich and Toll Creagach Easy route mostly on paths. 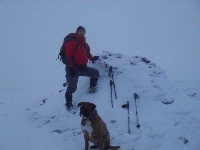 Me at summit with Oscar (12.2.11). 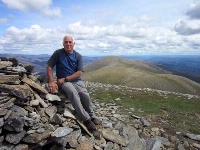 Post a few words about Tom a' Choinich or read what others have had to say. 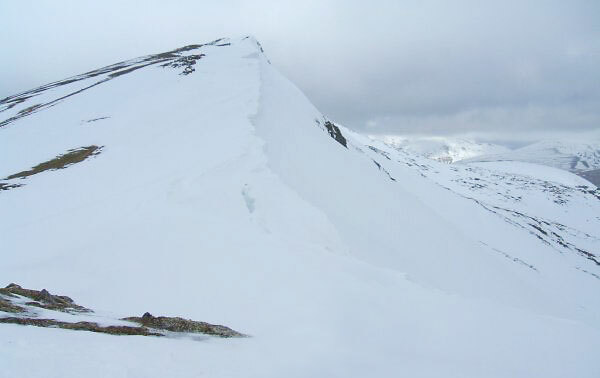 After the initial 4km approach to Tom a' choinich a zig-zagging climb up the south-east ridge is made with some occasional scrambling required. The ridge narrows nearer the top which is where the scrambling is to be had but then it eventually becomes a flat broad ridge leading up to the summit. 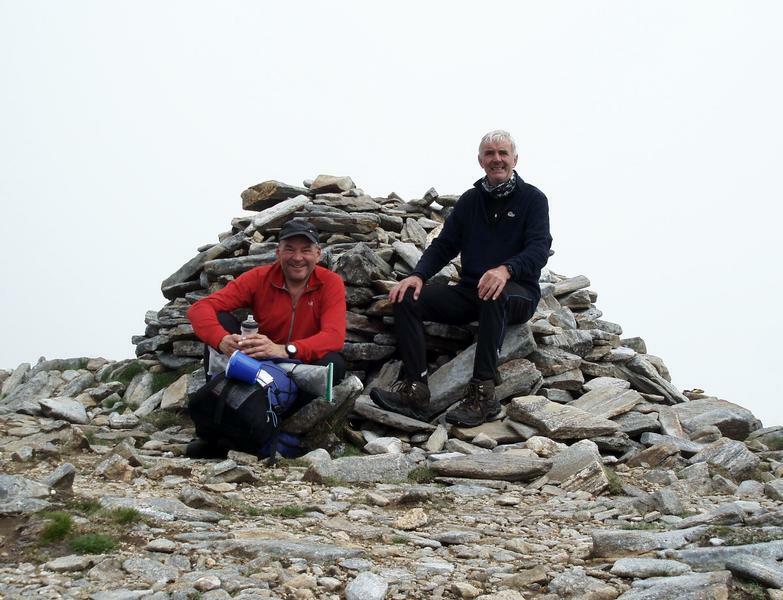 The continuation to Toll Creagach is worthwhile and is done by crossing the bealach Toll Easa then following broad grassy slopes to the rounded summit.